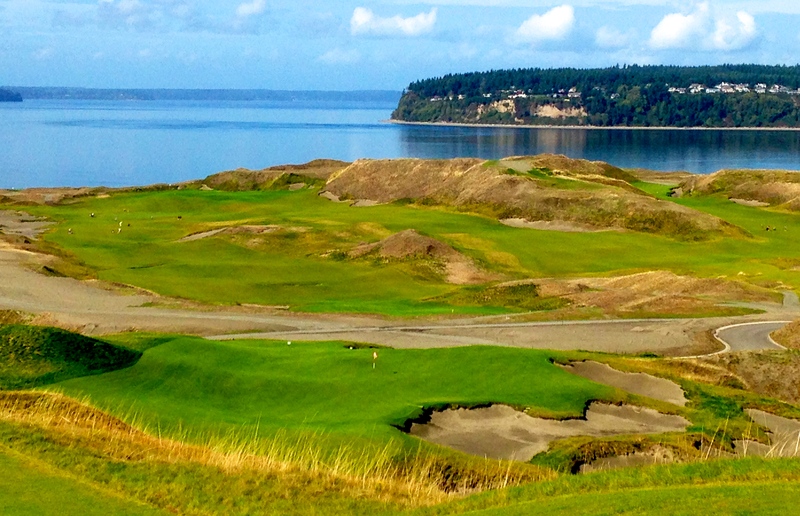 Puget Sound provides a stunning backdrop for golfers playing at Chambers Bay. UNIVERSITY PLACE, Wash. – At the start of 2015 Chambers Bay was viewed as an exciting new venue for June’s U.S. Open. Four months after Jordan Spieth’s victory in one of the most dramatic finishes to that championship the course is viewed differently. Now, four months later, it still has the historical benefits from being a major championship site, but it’s even more a travel destination than it was before Dustin Johnson three-putted the last green from 12 feet to give Spieth his second major title. 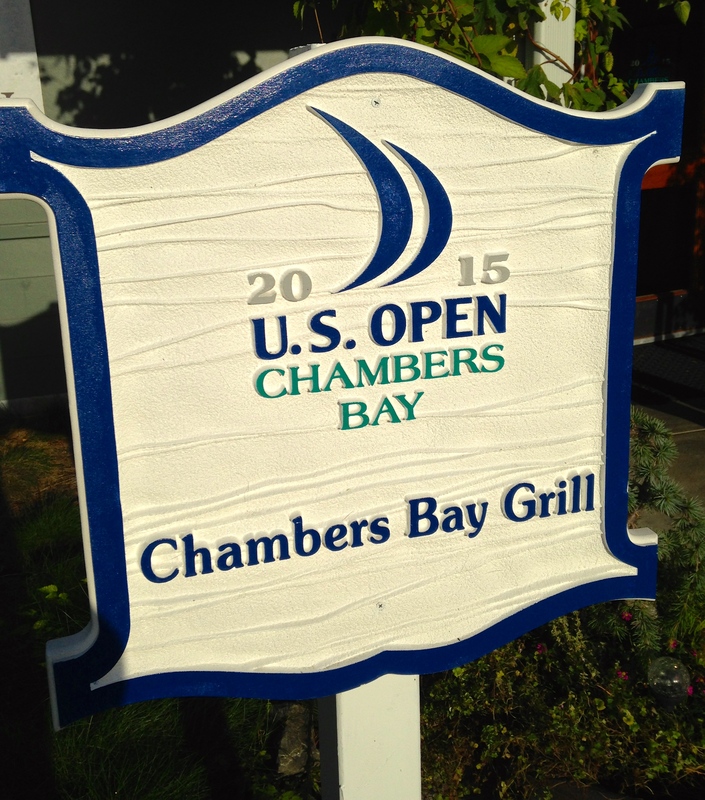 Chambers looks a lot different than it did during the U.S. Open, the first ever held in the Pacific Northwest. The corporate hospitality tents are gone, of course, but the beating the course took from welcoming 280,000 visitors in that one week is still evident. The visitors are still coming, though. They’re coming strictly to play now. General manager Matt Allen has seen it all at Chambers Bay. There’s a different perception of Chambers in the aftermath of the big event. There was an aura of mystery about it before the Open. Now that the game’s best players have dealt with it there’s more an anticipation to learn what this place is all about. 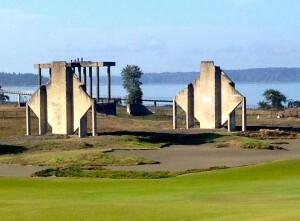 Chambers Bay was a good story to tell before the Open; it’s an even better one now. This is a county-owned walking-only golf course. Caddies aren’t mandatory (though they’d be helpful on the 7 ½-mile jaunt that includes the equivalent of 13 floors in elevation). Staffers are assigned to various spots on the course to help the players in various ways and facilitate play, but there’s much more to the Chambers Bay experience. For one thing, there’s no definition between the greens and the fairways — an extreme rarity in the U.S. courses. A train regularly runs along the outskirts of the course, which offers stunning water views of Puget Sound. For historical perspective there’s the remnants of the sand and gravel storage bins that dominated the property a couple decades before it became a golf course. Now they give the course a Stonehenge look. A three-mile walking/biking trails winds through the course, much like Scotland’s storied St. Andrews, but golfers aren’t impacted by it at all. The same for a dog park. 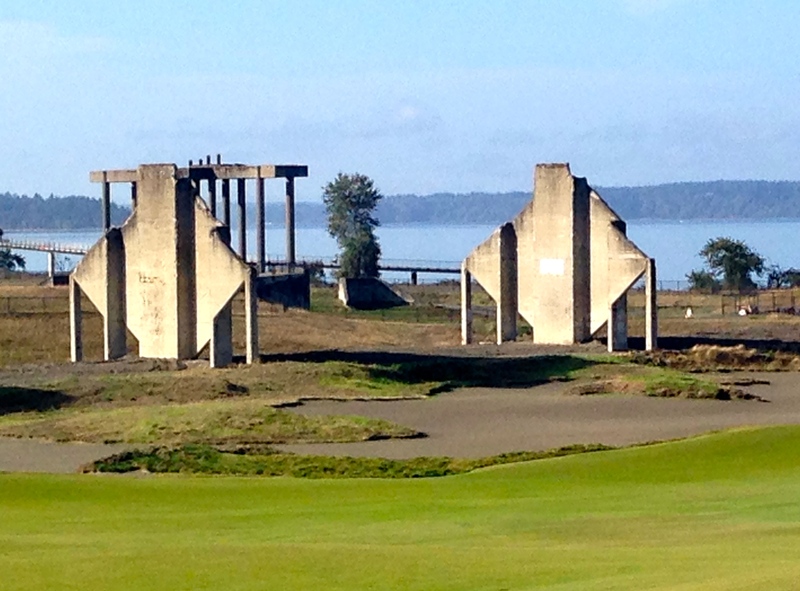 Chambers Bay is a benefit to its community, not just to the golfers. 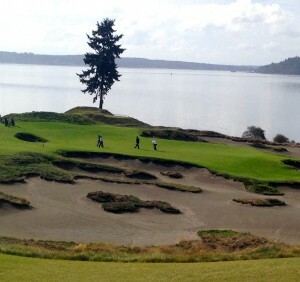 The Lone Fir behind the green at the par-3 15th hole is a Chambers landmark. Unlike most every other U.S. Open venue, there’s no big clubhouse. The pro shop is relatively small (but certainly adequate). Players are taken from it to the range and first tee via a shuttle, and a trailer houses the snack shop, where you claim your push cart or hook up with your caddie. It’s a friendly setting that becomes even more enjoyable as you meander through the course. It’s a course like no other – at least in the United States — and we enjoyed exploring those differences. You frequently putt from great distances. 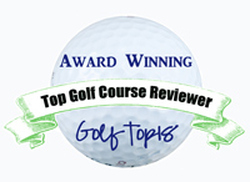 To play well you have to cope with the many undulations, on the fairways as well as the greens. The fairways are huge – No. 13 was the widest ever at a U.S. Open – and the rough isn’t so penal that it scares you. 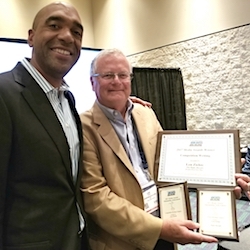 The two of us, both very avid but ordinary recreational players, lost only one ball between us while playing with two Chambers veterans – general manager Matt Allen and assistant professional Ryan Young. The U.S. Open didn’t always present Chambers Bay in a favorable light, which created a mind-boggling dilemma for Allen. The conditioning of the greens were a problem, no doubt about it. 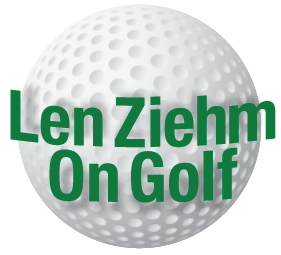 Allen attributes it to record heat in May and June, and it continued for two months after the tournament. That made recovery from the Open more difficult. Still, recreational play resumed the Friday after the last putt dropped and Chambers Bay returned to being a great asset to its community but with a higher profile. 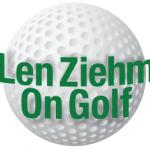 But Hazeltine survived to host another U.S. Open and as well as a PGA Championship, U.S. Amateur, U.S. Women’s Open and U.S. Senior Open. It will also be the site of next year’s Ryder Cup matches. Chamber Bays’ story is a bit different. The course was built by Pierce County with the intention of landing a U.S. Open. That was an extraordinary mission, with lots of parties involved. Among the key ones were John Landenburg, a Pierce County executive who convinced local politicians to to spend $20 million on the project; Robert Trent Jones Jr., the architect; Chicago-based KemperSports, which manages the facility; and the U.S. Golf Assn. They worked together to get the course open in 2007, the accolades poured in immediately and by 2010 Chambers was hosting a U.S. Amateur. The 2015 U.S. Open made Chambers the only course built in the last 50 years and the first with links-style architecture to host the tournament. Remnants of abandoned sand and gravel holding bins provide a Stonehenge look along the No. 18 fairway. Add to it the fact that Chambers’ No. 12 hole yielded the most eagles in U.S. Open history, and you have a lot of golf history made in a very short time frame. Allen has been at Chambers almost from the beginning so his perspective is noteworthy. After completing his studies at Oregon he was – at age 21 — named the tournament and course rating director for the Oregon Golf Assn. 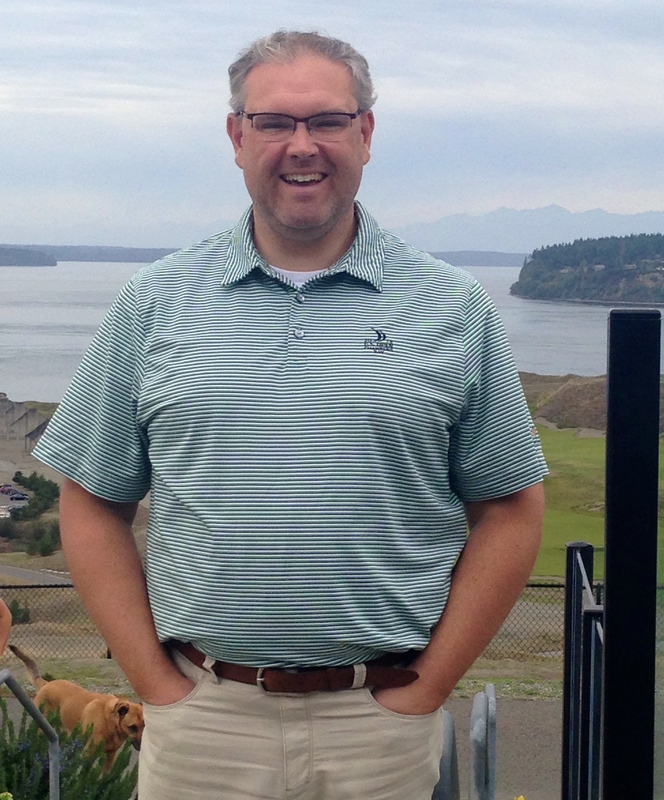 Now a 17-year employee of KemperSports, he moved to Oregon’s then up-and-coming Bandon Dunes Resort in 1999 as assistant general manager and has been GM at Chambers for seven years. He recorded every Open-related telecast, but hasn’t gotten through Day 1 in viewing it all yet. Trains run beside the course throughout the day, adding to the Chambers’ charm. He expects Chambers Bay to return to as a major tournament venue at some point, but it’ll be tough to top what’s happened there already. And accommodate curious players. There’s a lot more of them now. Allen said Chambers drew players from only 12 states in the late summer months of 2014 as the Open was closing in. In the three months after this Open, though, players from 57 different states or countries have teed off there. One from France was playing during our visit. “We’ll see that traffic for a long time to come,’’ Allen predicted. 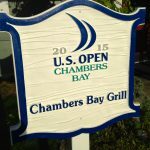 Chambers is now even offering a unique golf package in conjunction with Tacoma’s Hotel Murano and two nearby facilities – The Home Course in DuPont and Gold Mountain in Bremerton. The Home Course was Chambers’ alternate course in the 2010 U.S. 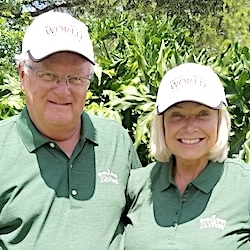 Amateur and hosted the 2014 U.S. Women’s Amateur Public Links. Gold Mountain hosted the 2006 U.S. Public Links and 2011 U.S. Junior Amateur.